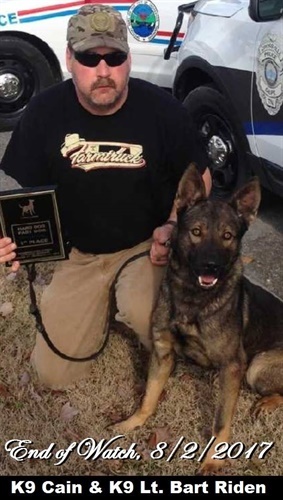 A Crossville (TN) Police K-9 was killed after being stabbed multiple times while pursuing a suspect who allegedly led officials on a chase in a stolen semi. The chase began shortly before 5 a.m. Wednesday on north Highway 68 near Grassy Cove after dispatch operators received a call that a semi had sideswiped a vehicle. A deputy tried to pull over the truck, but the driver wouldn’t stop. After a pursuit, the suspect crashed into a tree and tried to flee on foot. From there, K9 Officer Cain pursued 28-year-old Dustin Lee Dixon on foot. At some point, the K9 was stabbed multiple times and mortally wounded, Nashville News Channel reports.